I haven't been doing much camera trapping since finishing up at Paarl Mountain. Some new software projects have been keeping me busy, but I've also been having trouble with my left ankle. I can walk around okayish, but I don't feel up to doing any off-road walking or even light jugging. Luckily I can still manage to visit the local park with the dog. Earlier this month we crossed paths with this Cape Dune Mole Rat at my local park. It didn't slow down for us and paid me almost no attention at all. It just ran in a straight line, going somewhere with a purpose. It ran quite some distance, so I had time to try and get in front of it to maybe snap a better photo or two. It was overcast and moving fast. As a result the photos didn't turn out very good, but still better than nothing. Interestingly the front teeth protrude through the lips, allowing the animal to dig or bite vegetation without getting a mouth full of sand in the process. Their eyes are very small, with very poor eyesight. It is thought that they can barely distinguish between light and dark (day and night). 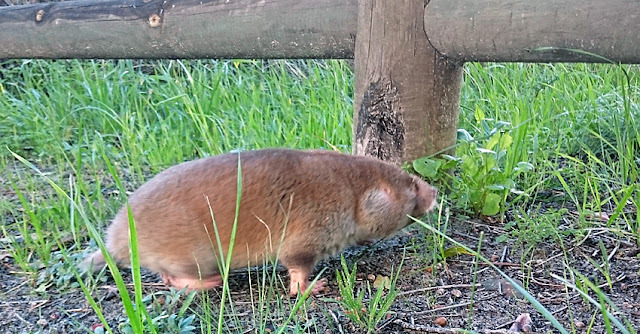 However, not being able to see where it was going didn't seem slow this mole rat down. As soon as it reached a specific mole heap, having passed many others on its way, it stopped and started digging. The Cape Dune Mole Rat lives underground and the most one usually sees of them are the huge mole heaps they push up, or maybe a glimpse of one pushing out a fresh lump of sand from underground. I seem to sometimes find them above ground during very overcast or misty-rainy weather. It is also during these wet times that the mole rats tend to produce more fresh mole heaps. I guess the sand is easier to work with when it is wet. 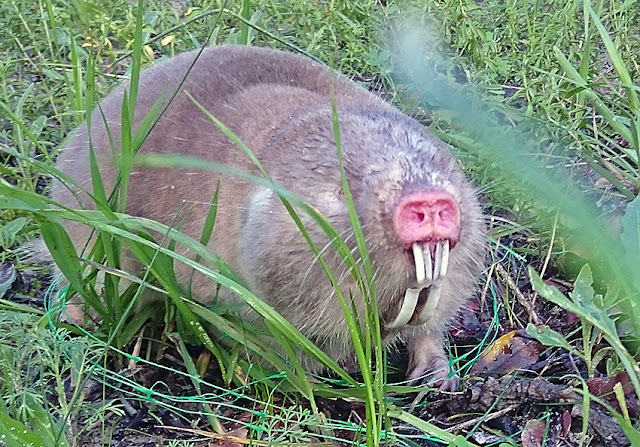 The Cape Dune Mole Rat is quite large, ranging in size from 27-30 cm and 0.5-1.3 kg. In fact it is believed to be the largest mammal that spends most of its life underground. 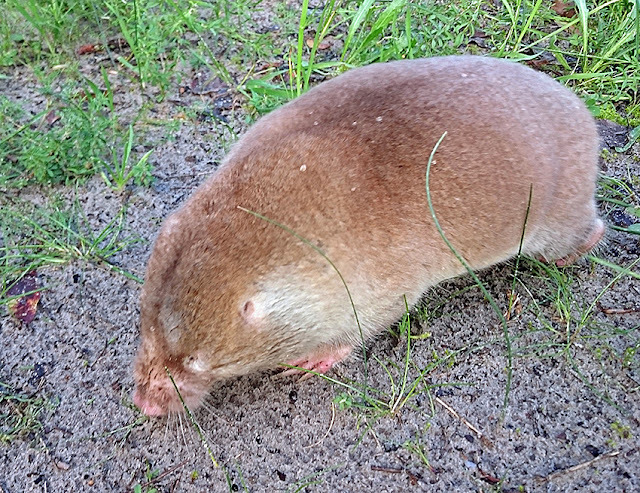 Cape Dune Mole Rats are solitary animals. Each individual maintains its own network of tunnels. I think what happened here was that this is maybe a male which caught the sent of a nearby female. July is in the middle of the breeding season, with around 3 youngsters being born two months later. They can live for over six years.